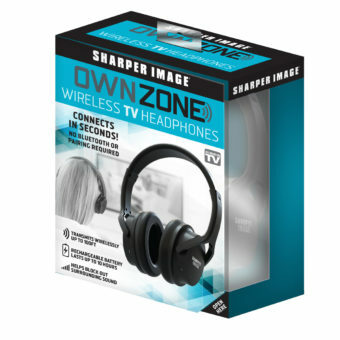 OWN ZONE™ Wireless TV Headphones allow you to watch TV without disrupting others, and without others disrupting you! Surround yourself with full stereo sound. Watch the game without interruption from kids or watch your favorite movie while your significant other sleeps next to you; it’s that convenient! The headphones work with 2.4GHz Digital Technology that transmits up to 100FT and wirelessly connects to virtually any TV in seconds! * Headphones work right out of the box, no pairing required! Features adjustable headband and super-soft ear pads and includes all charging and audio cables needed! Connect to your TV with one of three included cables; AUX, RCA, or Optical. Rechargeable headphones; one full battery charge lasts up to 10 hours.